Ranked as the number one for managed cyber security software on the global market, Bitdefender protects 500 million endpoints from known and zero-day threats. As a leading security solution for physical, virtualised and hybrid environments, Bitdefender’s GravityZone is tailored to reduce the costs of building a trusted environment for all endpoints on Windows, Linux and Mac OS X systems. With increasing cyber security concerns, you need more than a free anti-virus solution to rely on. Choosing our managed GravityZone will enable you to stay safe while conducting business in the cloud with the best performing, most trusted and easy-to-use software. 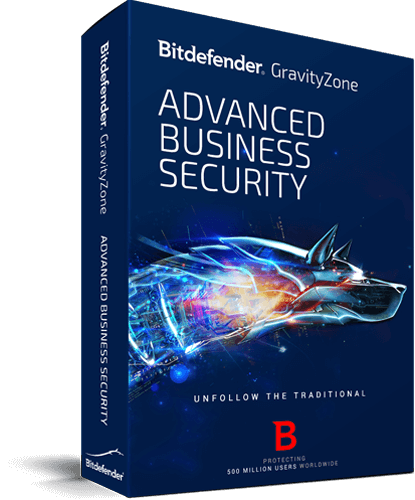 Featuring supreme anti-virus and anti-malware protection against ransomware, Trojans and other zero-day threats, Bitdefender Gravityzone also contains a firewall and web filtering system for Windows operating systems to guard endpoints from all angles. Consistently ranked as the number one anti-virus solution for a number of years, Bitdefender GravityZone is able to catch advanced threats that other solutions might miss. It means you get peace of mind with a managed cyber security solution that can quickly stop infections, computer slowdowns and ransomware from invading the system network, and with out full management and monitoring, you know that any issues are being handled behind the scenes. Bitdefender GravityZone uses reflective models and advanced machine learning algorithms to extract malware patterns so that it can detect, anticipate and take action on known viruses, ransomware and zero-day threats quickly. With Security Endpoint Relay, Content Control and Device Control you can restrict access to specific applications and websites remotely, protect data, allow automatic device discovery for easy installation, and configure updates throughout the network much more efficiently. With a simple but powerful cloud-based web console, we manage all of your devices in one place with access to installation, configuration, monitoring and reporting features in real-time. We manage your quarantine, track actions through audit logs, and select different access privileges with role-based user models. A managed cyber security solution you know you can trust. Bitdefender Advanced Threat Control (ATC) permanently monitors running processes for signs of malicious behavior. A pioneering technology launched in 2008 as AVC, ATC has constantly been enhanced, keeping Bitdefender one step ahead of emerging threats. Artificial Intelligence and machine learning are essential to combat a threat landscape that is larger and more sophisticated than ever.